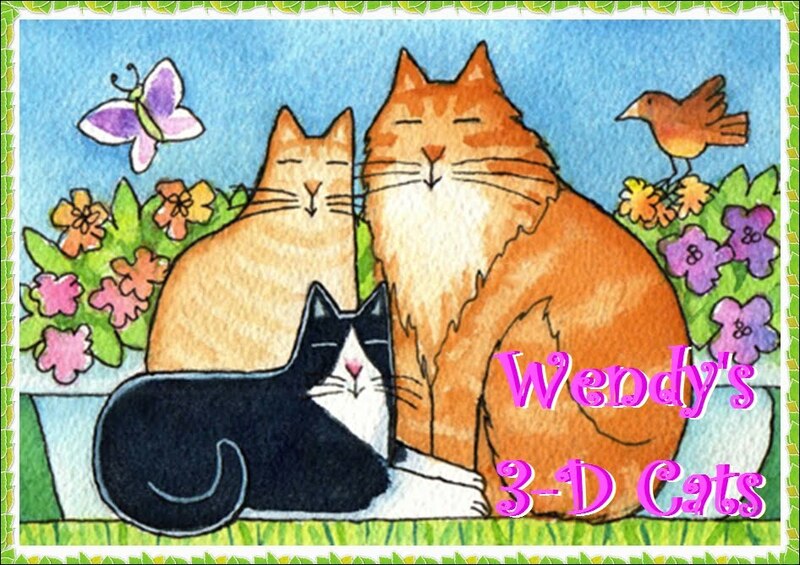 Wendy's 3-D Cats: THE 3-Ds ARE EGGING YOU ON! The 3-Ds, Dante, Dylan and Domino, would like to wish you a Happy Easter. 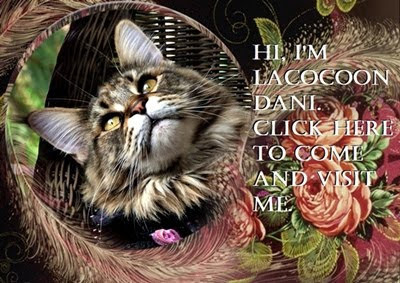 They have each dressed up for the occasion to suit their very individual PURRSonalities. You may want to biggify the pictures to properly appreciate all of the deTAILS. Here's Dante Bunny with his rabbit ears, nose and floofy cottonTAIL! He's puzzling over the age old question "What came first, the chick-hen or the egg?" It's even more complicated now because this newly-hatched chick appears to be part-rabbit! The 'yolk's' really on you, this time, Dante! Dylan is dreamy as a black-eyed daisy. Domino finally slugged him, so his ego (as well as his eye) is quite bruised. Oh well, that's what he gets for 'egging' her on. So Dylan's thoughts now turn very far away to his heavenly Halle. She is supposed to arrive tomorrow to spend the weekend with him and minister to his wounded spirit. So no worries, there -- everything's going to be 'just ducky'. All Dylan can say is "HALLElujah to that!" 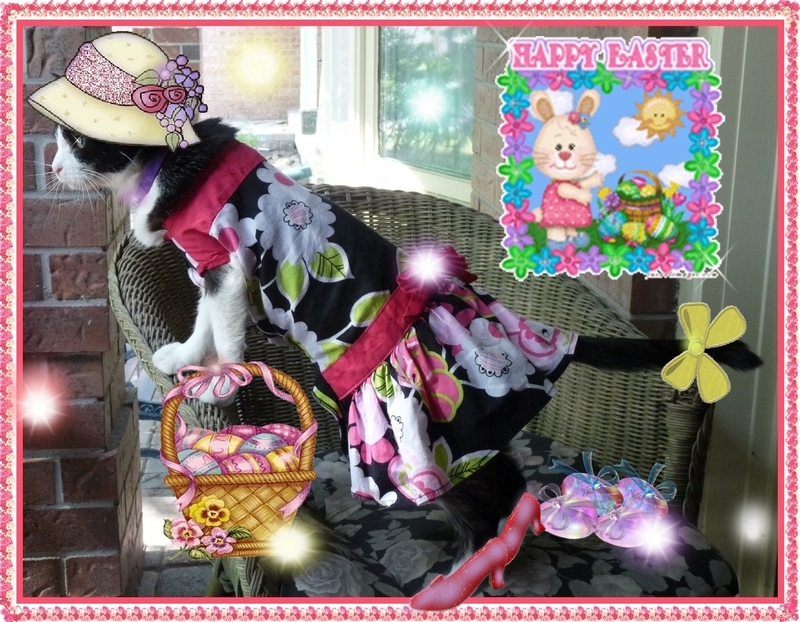 And finally, here's darling Domino all dressed up for Easter! She's really 'FROCKing it' in her Easter bonnet, dress and shoes. She's carrying an Easter basket just brimming with eggs and she's willing to SHELL them out to whoever might want one. Her sweetheart Milo is on his way over for an Easter date and together they're going to have a 'smashing' good time! I just hope they don't end up with 'egg' on their faces. You all look eggcellent!!!!!! Happy Easter to all of you from all of us! Happy Easter weekend to you all, we hope it's joy-full! 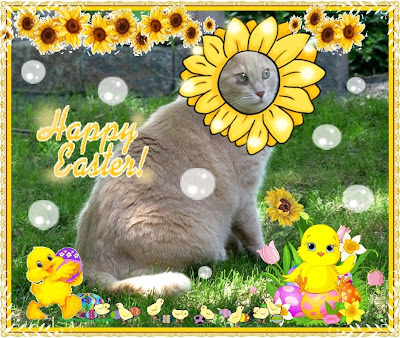 Happy Easter to all of you in your Easter suits! Eggcellent! 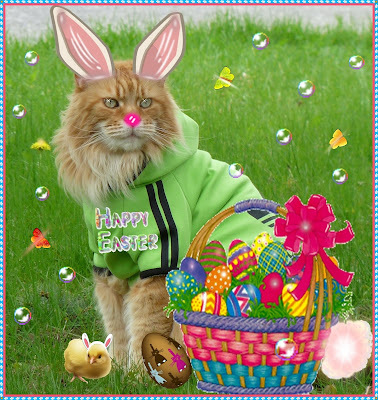 Yous guys look great in your Easter Finery! Dylan with the sunflower has us rolling! They all look great, always! We got a good laugh at the boys and Domino looked so classy. No jumping in those pumps though! It sounds like it will be a very nice Easter weekend at your place. You all look great for Easter. Happy Easter to you. Looks like a great Easter there! Happy Easter. Oh my, how did I miss this post!? Hope you had an awesome Easter! I've been having an awesome time with you this week Dommy.